I bought this dress to wear to a summer wedding. I love the classic styling, but my matronly body no longer likes sleeveless dresses. 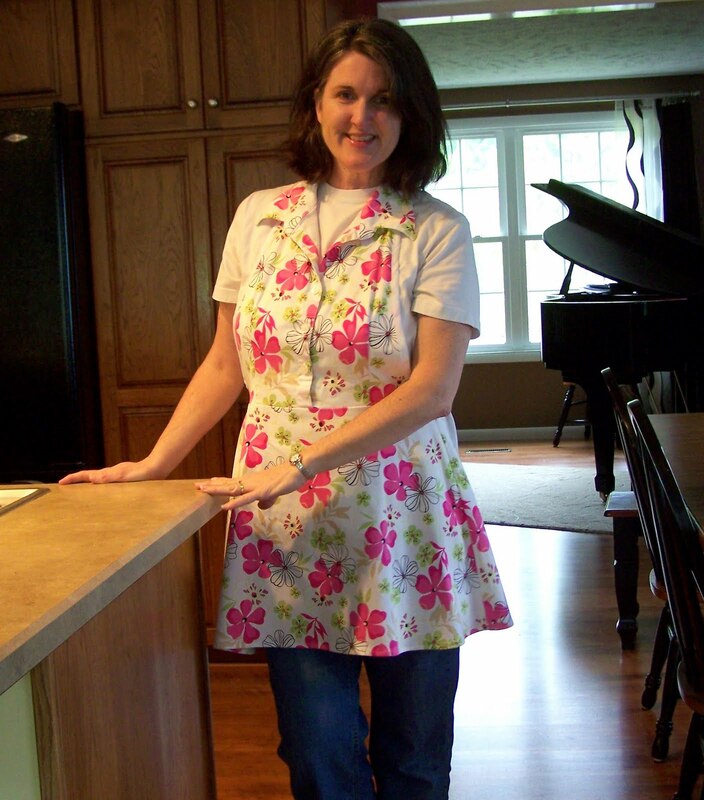 So I decided to cut it into a fun apron that would make me feel like Donna Reed in the kitchen, even when I wear a t-shirt and jeans! 1. Prepare neckline. This dress was a halter style and sleeveless, which made it perfectly simple to convert to an apron that slipped over the head. 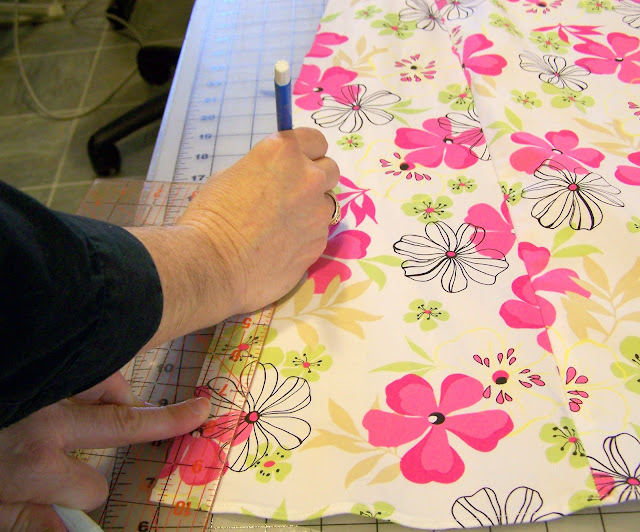 If you have a standard dress, simply cut across the top, finish the edge and add straps. 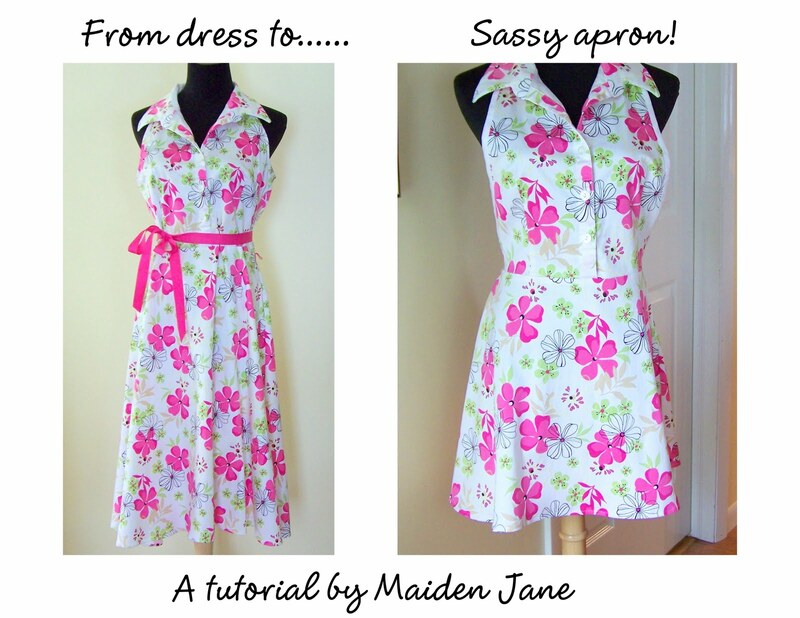 Use an existing apron as your guide! Cut along back neck edge. A halter strap will remain. 2. Mark and cut the sides of the apron. 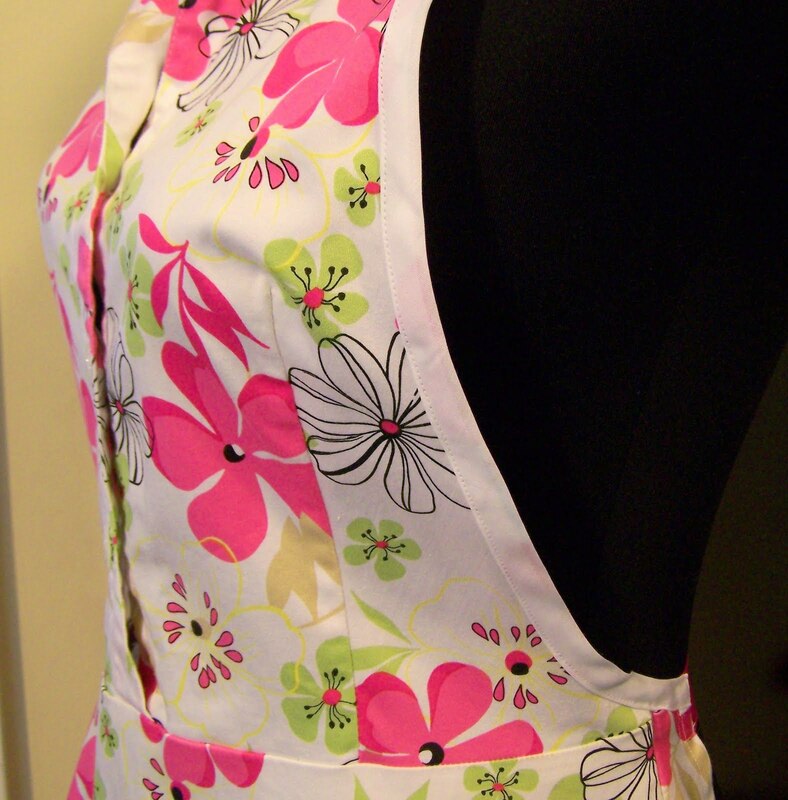 I simply eyeballed the cut of the apron I desired. 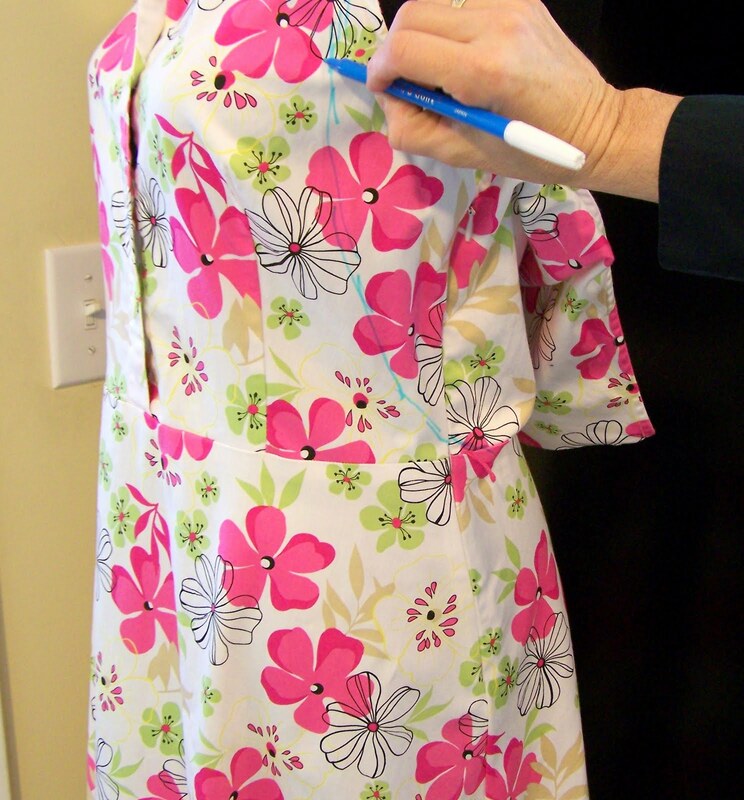 Again, if you are unsure, place an existing apron on top of your dress to get the design from the top to the side. Cut along the mark from the neck to the waist. 3. Fold the apron in half and cut the other side. 4. 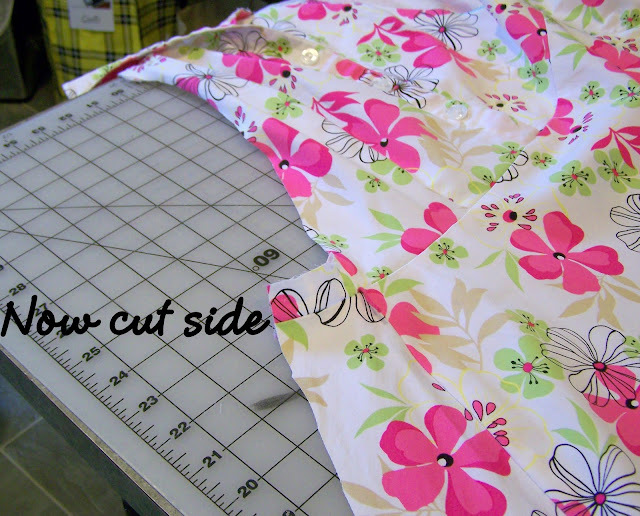 Now that you have the top of the apron, you have to cut off the back part of the dress. I decided to have the apron extend an inch or so beyond the side seams. 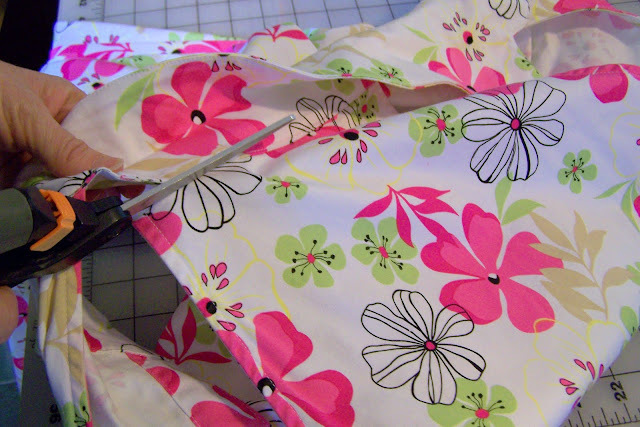 Again, fold the apron in half and cut the other side equal to the first side. 5. Determine the length of the apron. I shortened my dress about 10 inches and then cut. 6. Finish bottom and sides. 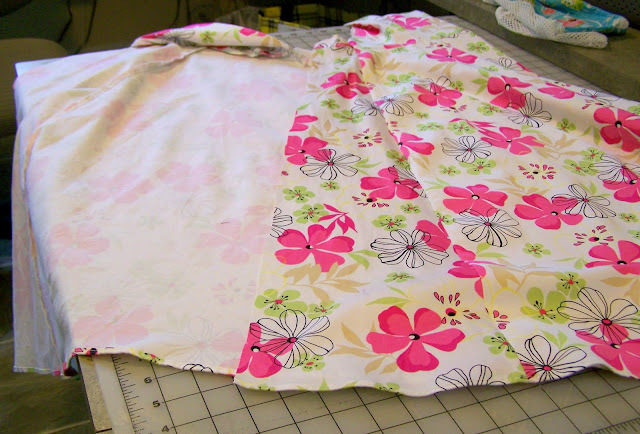 I finished the sides and bottom of the apron by folding fabric 1/4″ to the wrong side and pressing. 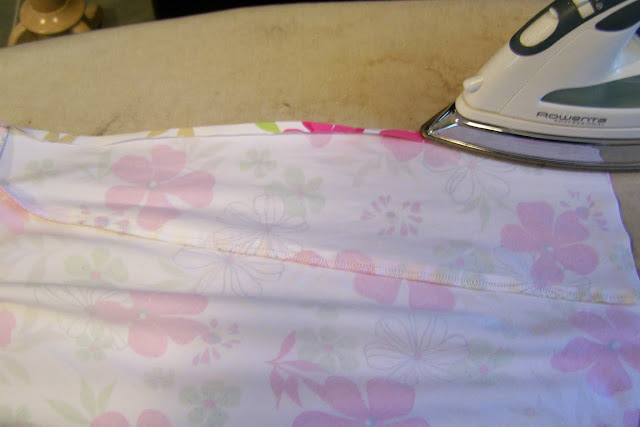 Press again to enclose the raw edge and stitch. 7. 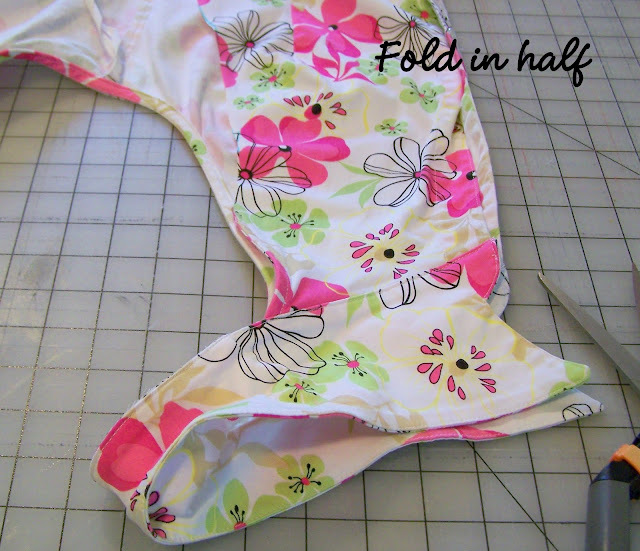 Finish arm and neck edge with extra-wide double fold bias tape. 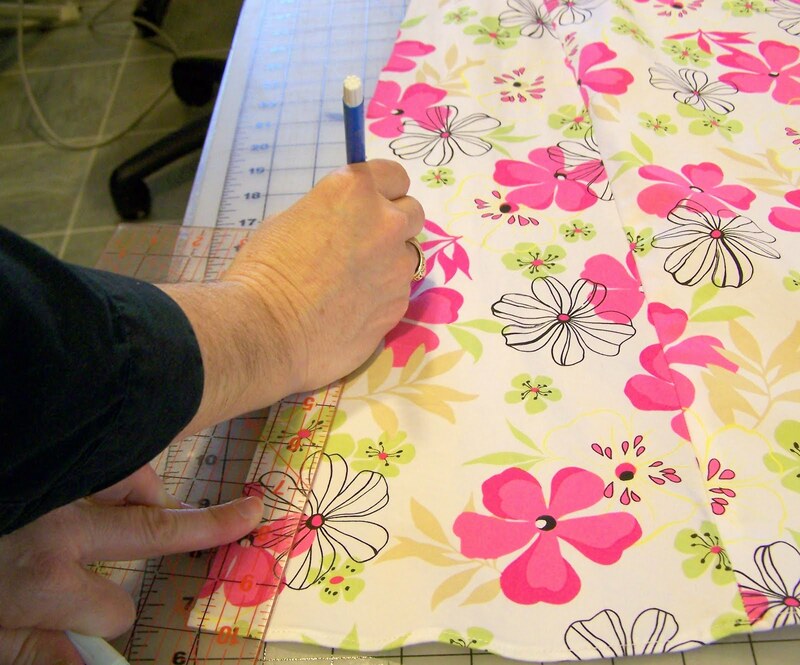 Depending on the style of your dress, you may be able to finish all raw edges by folding the edges under as in step 6. 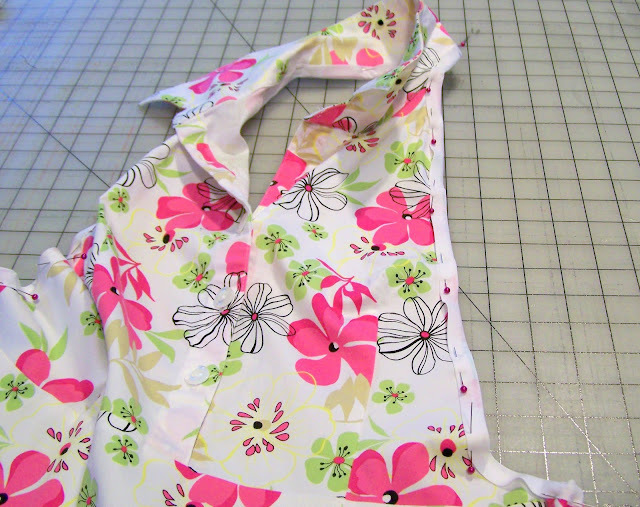 In the case of the halter, the exposed edge along the cutting line was too thick to fold, so I used bias tape. 8. 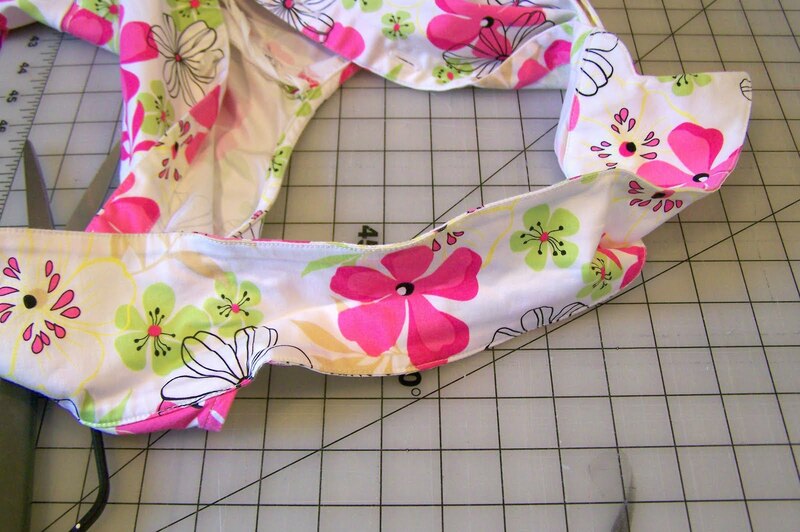 Sew on straps at the waist line. 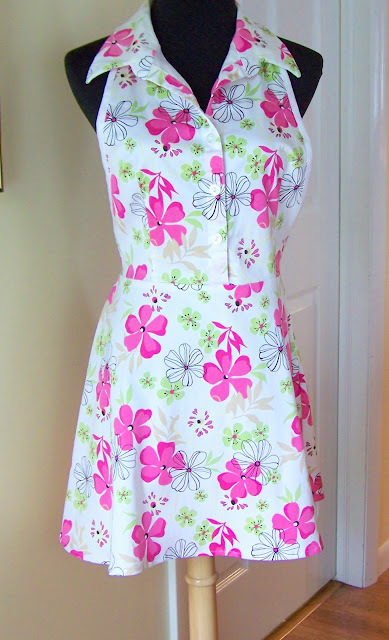 This dress came with a pink ribbon, so I cut it in half and sewed it to the sides, folding under the raw edges. Enjoy! The perfect style to keep my front covered (half-aprons just don’t cut it for me) and make me feel like I’m a little more stylish than I really am! I love love love this idea! Simply brilliant- it’s one of the cutest aprons I’ve ever seen and I totally want to make one. This is both cute and clever! This look so amazing! You did a wonderful job! I love that as an apron! What a great idea! You are so clever. I am going to have to go through my closet and see what I can do with the things that don’t fit (bummer). 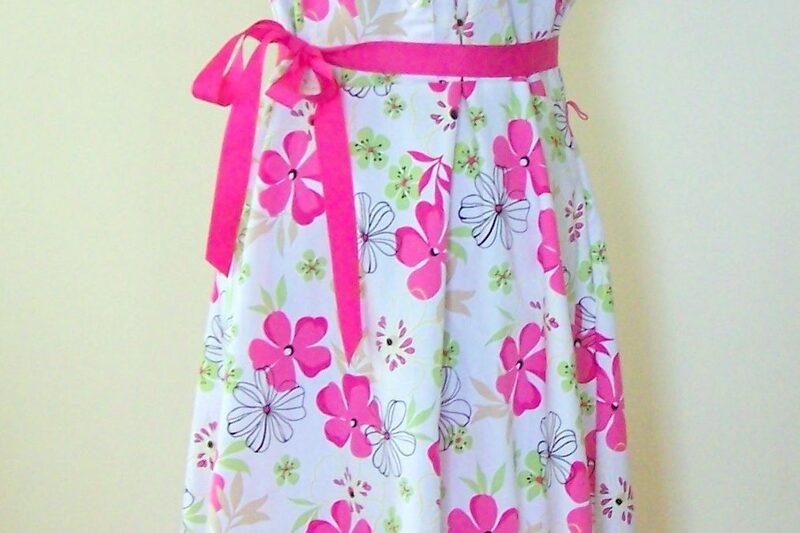 I have this long linen skirt that would make a great apron. Thanks for sharing so much on your blog! This is a great tutorial! Very cute. 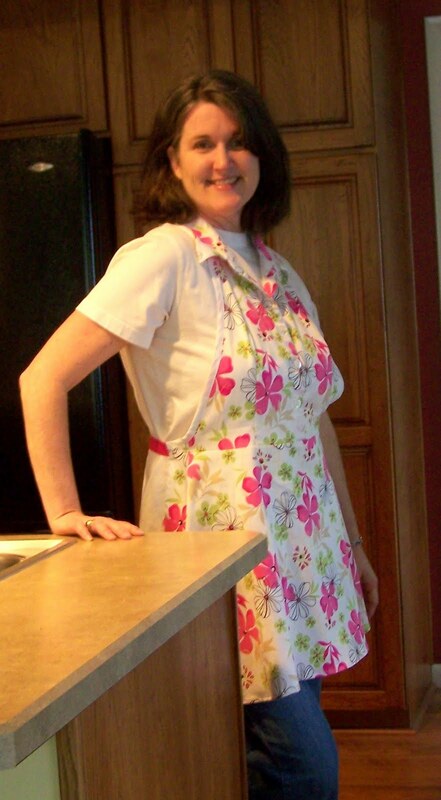 That is a really cute apron! I need an apron badly, I always make such a mess in the kitchen! This is such a great idea! 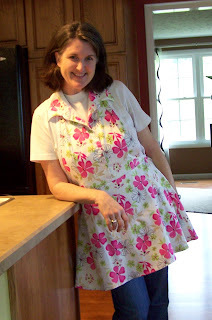 I am now scouring my closet for dresses to turn into aprons. Thanks for sharing! Cute! what an excellent idea. I don’t get along very well with the sewing machine, or I would definitely try it myself. Very cute.What a good idea!Looks great on you. That is a really pretty fabric and I love the new length! 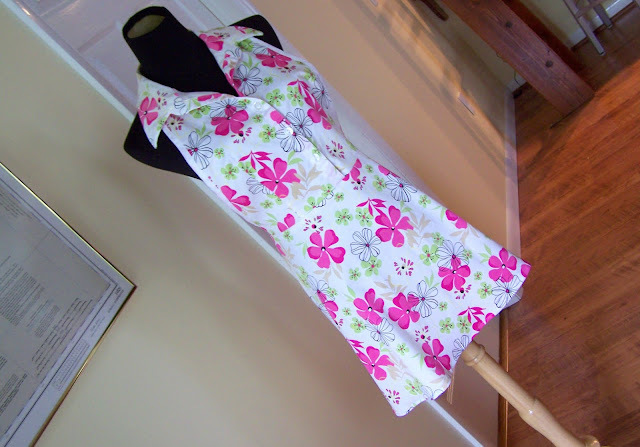 Aprons and up-cycling, two of my favorite things! Very cute results! I really love this. It seems like ready-to-wear manufacturers get the best fabrics. I’m hitting the thrift store!! I’m adding to Sewing Tutorials Library, too. Thank you for the great idea! Very cool project! 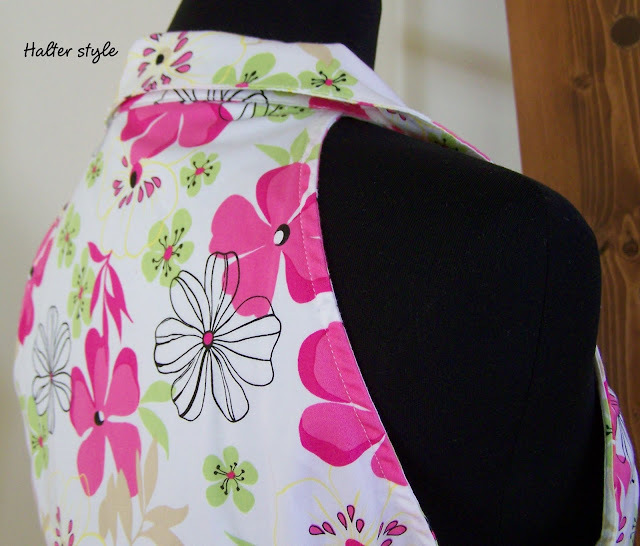 I love to upcycle fabric, and this is a fun new idea.